Do attitudes towards catch and release highlight an inconsistency at the heart of fish conservation? Person A (maybe a rookie angler) posts a proud picture of their latest catch. Maybe they’re holding the fish, perhaps it’s lying on the floor. A few people make some nice comments: “Nice fish,” they write, and “Lovely.” And Person A feels great all over again, and maybe gets to tell the tale of its capture a few times (surely the best part of fishing). Then along comes Person B. We all know Person B. Person B has been fishing for longer than anyone, has fished more waters and styles than anyone, and certainly knows better than anyone. Person B is a catch and release warrior. But at Fishing TV we have mixed feelings about catch and release. We think that to insist upon 100% catch and release, in any fishery, probably betrays a lack of scientific understanding, and perhaps worse, a lack of human understanding. The smorgasbord of approaches have that been taken over time and in different countries, and different rules at different fisheries cause confusion. ‘Harvest limits’ can have the negative impact of offering something of a target for some anglers, while all out bans on taking fish can discourage those who enjoy catching for the table. The usefulness of catch-and-release is often called into question, when it comes to preserving fish numbers. There are those who claim that the fish are psychologically traumatised by the process, and there are startling statistics about the survival rates of marine fish, particularly billfish which suffer from sudden changes in pressure when caught in deep water. Piercing the swim-bladder, once thought to reduce this risk, has now been shown to have the opposite effect. Among freshwater fish up to 40% of released fish may subsequently die from the stress resulting from the hook-fight-land-release process. However, since some famous carp have been caught dozens of times over the years, we know that for some species at least, the damage is minimal. For each angler who likes to speak or write in majestic prose about the communion between man and nature, and how the challenge of catching the fish is satisfaction enough, there’s another who regards the process of catching, preparing and eating their own food as offering a deeper satisfaction – a more primal connection with what we eat and how we gather it. 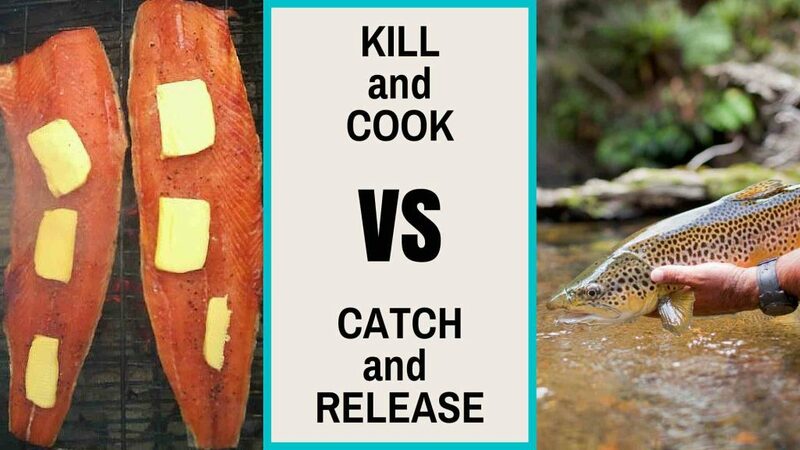 Given what we now understand about the efficacy of catch and release – that it by no means guarantees the survival of the fish – there is a strong argument to be made that catching fish and not killing one for the table is a more immoral act. If we don’t kill what we catch, we’re merely reducing the life expectancy of the fish for our own pleasure, potentially condemning the fish to a slow death through starvation or as the result of a stroke or heart attack. But I can already hear Person B’s plaintive wails: “If everyone killed fish all the time, stocks would plummet!” And that’s true, as far as it goes. This writer has recently returned from a trip to Scotland for a week of fishing on one of the most prolific salmon beats in the country. We caught 36 salmon in the week, and I don’t mind admitting that we killed and ate a fish. That fish served as our ‘last supper’ before the party broke up for the week, feeding 15 people, and served to cement the bonds that had formed over the course of the week. It was at once a celebration of this remarkable species, an acknowledgement of the battles fought, and yes, a victory party for we humans. This doesn’t make us bloodthirsty killers, and I assure you that everyone in the party identified as a conservationist. The impact of such activity (we returned 97% of the fish caught) is negligible. Catch-and-release hardliners would do well to remember why humans began to fish in the first place – for food; those who do like to fish for the table should limit themselves. “Don’t take more than you need” is a philosophy that many of us would do well to consider more often in life, whether that relates to donuts or fish. But this does not mean that we should only fish for the table. The statistics show that catch and release has had a positive impact on fish stocks around the world, and many scientific tagging and genetic programmes now rely on catch and release to help monitor things like migration patterns. What it does mean is that anglers, whether catch-and-releasers or those fishing for the pot, should consider the impact of their actions, and, perhaps more importantly, reserve judgement against those who do things differently from themselves. Neither position is 100% morally defensible, so our message is that we should all dismount the high horses and respect each other’s choices, and above all respect the quarry.